Left to right, Peter Follansbee, Freddy Roman, and Phil Lowe. 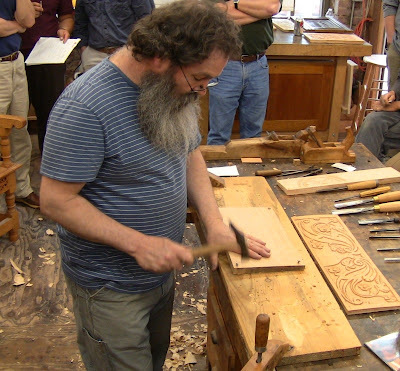 Freddy Roman organized another excellent monthly meeting for the New England chapter of the Society of American Period Furniture Makers this past Saturday. 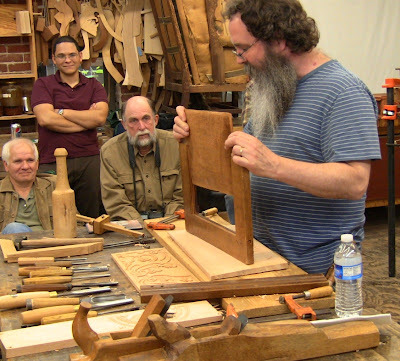 Hosted by Phil Lowe at his Furniture Institute of Massachusetts, it featured Peter Follansbee demonstrating 17th century green oak joinery and carving. Videos of the day appear at the end of this post. Peter has an excellent website and blog packed full of information. 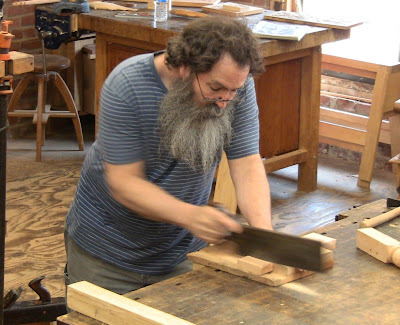 A joiner at the Plimoth Plantation living history museum in Plymouth, MA, for nearly 20 years, he's a protege of Jennie (formerly John) Alexander and Drew Langsner, doing green woodworking (woodworking using undried, recently felled wood); he also teaches at Drew's. 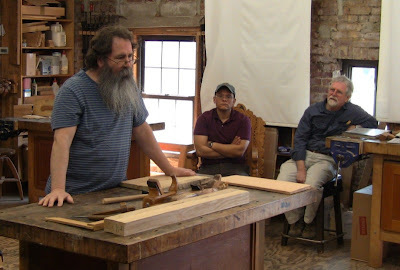 He has an article from the Spring 2009 issue of Woodwork Magazine in PDF form here, covering much of what he showed us. He also has a new instructional DVD available from Lie-Nielsen. He's an excellent presenter, so if you ever get a chance to see him in person or buy his DVD, I highly recommend it. 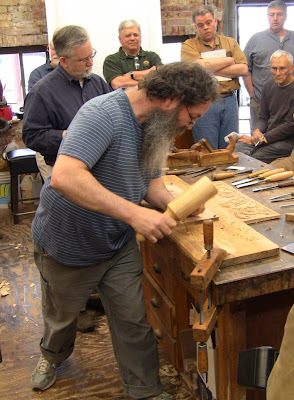 He's used to working in front of inquisitive audiences at Plimoth Plantation. 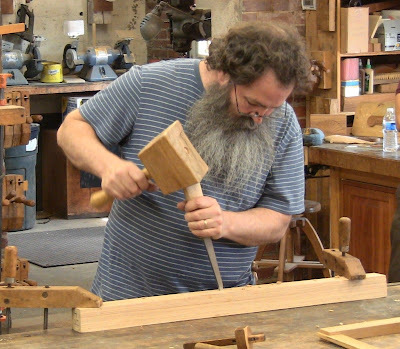 He works almost exclusively in green oak, building carved and joined chests and stools in 17th century New England style. Many of these items came over from England at the time. His primary method (he might say only!) 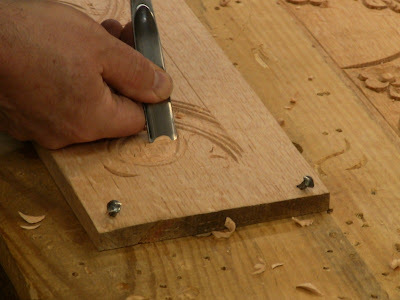 of joinery is drawbored mortise and tenon, often in frame and panel configuration, without glue. The fact that existing pieces have survived four centuries attests to the durability of this method. 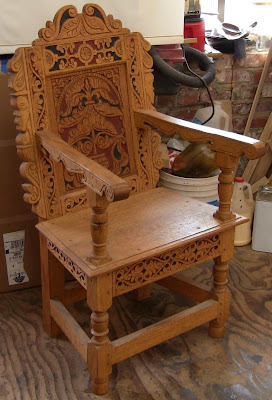 One of Peter's reproduction chairs built using these techniques. 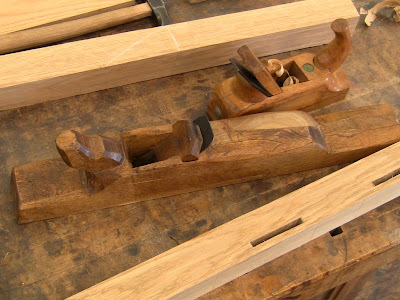 Peter's primary stock preparation planes: top, a smoother with iron ground to scrub profile; bottom, a shop-made jointer. I love the jointer, because it's literally made from a piece of firewood. Crude as it is, it still does great work. 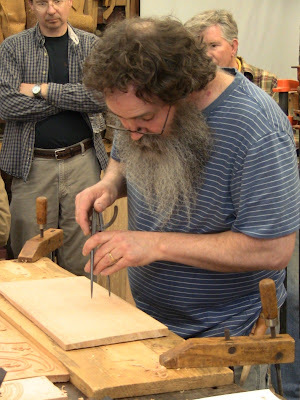 His simple travel toolbox, in the style of Toshio Odate's book "Japanese Woodworking Tools". This kind of work requires only a small set of tools. He carries around the wooden plane that's resting on top to show the indentation on the side at the front from the user's thumb. How many years of use did it take to wear that into the dense beech wood? 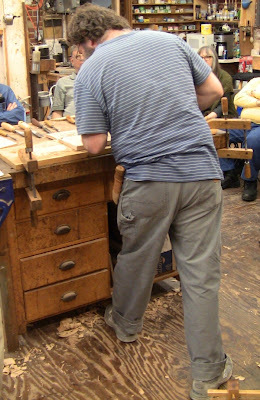 For the morning, Peter demonstrated stock preparation and joinery. He had several pieces in various stages of readiness, including a turned stool leg ready to receive its rails. He actually works very quickly, but takes lots of time to explain details and answer questions. 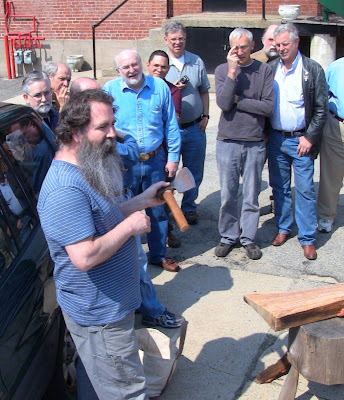 Out in the parking lot, Peter shows his hewing hatchet with cranked handle as he prepares to take the twist out of the piece of riven oak in front of him. Back in the shop, using the scrub plane for fast stock preparation. Where the hatchet was coarse, this is medium. Fine: final flatness with the jointer. One of the interesting things he showed us was how joiners didn't bother forming parts into perfectly rectangular cross-sections. They left the inner, hidden face truncated, in what Alexander dubbed a "truncadon" in this article. This allowed them to use narrower stock. 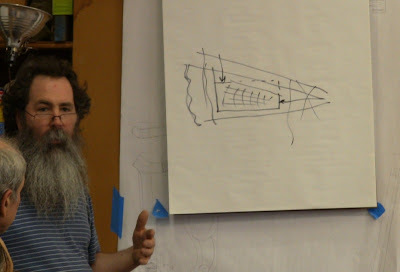 Illustrating the "truncadon" cross-section dressed out of a wedge-shaped billet, leaving one corner off the rectangle. 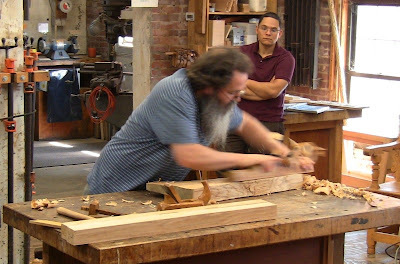 Cutting the tenon shoulder on a rail. 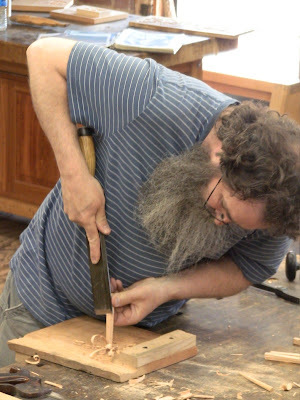 Boring a peg hole in a tenon. The hole is slightly offset from the matching hole in the mortise, so the peg draws it up tight when driven in. The resulting drawbored joint requires no glue. Shaping a drawbore peg. 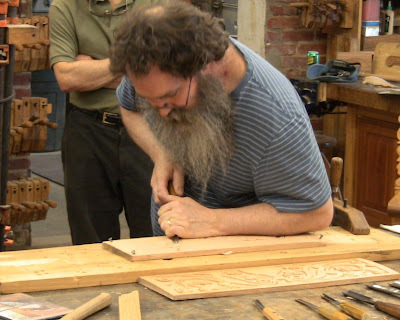 He doesn't use a dowel plate, he just rives off small peg billets, then shaves them down with a large framing chisel. With the pegs driven in and sawed off flush. That joint is tight and solid. 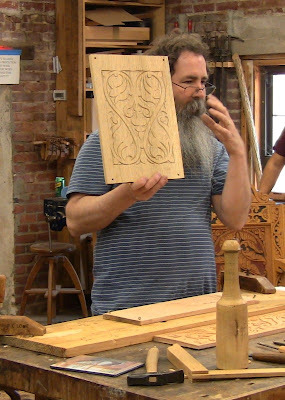 After lunch, Peter showed us a variety of carving patterns and techniques. 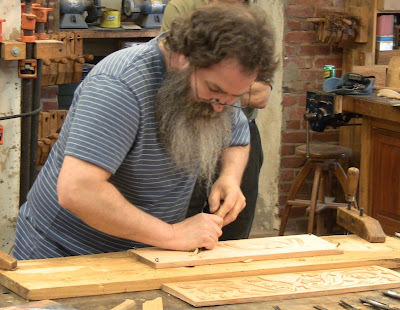 The work is nailed to a backing board, which is secured to the bench with clamps or holdfasts. 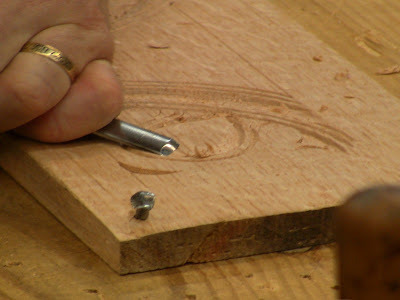 He moves around it to accomodate the grain and the line of the cut, rather than moving the piece. 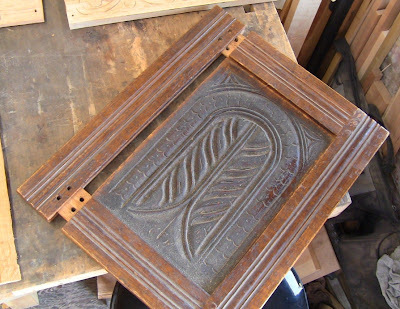 This is used to decorate rails and stiles, as in the photo above, or panels that may be nailed together into small boxes or joined into frames for larger chests. 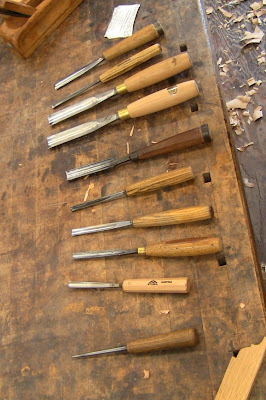 Peter's modest collection of carving tools. An example finished panel showing a symmetric S-curve pattern. He said this is about 45 minutes of carving. One thing Peter emphasized repeatedly was postures for control. 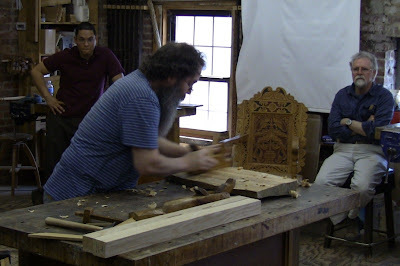 The following photos show a variety of grips and postures while making curved cuts, both with and without the mallet. Left elbow in tight, legs spread fore and aft to lower the body, driving the V-tool with a mallet. Forearm resting on the work, following the curve in one direction. Coming at it in the other direction. The workpiece stays in place as he moves around to accomodate grain and carving line. Pivoting with the feet and torso. 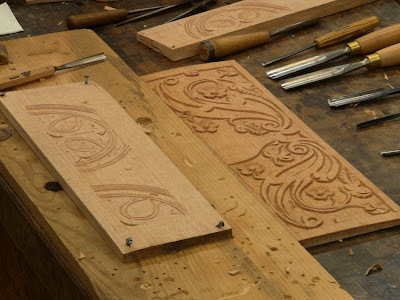 Some of this is full-body carving, not just the hands. It's very dynamic. Rear view of foot placement. 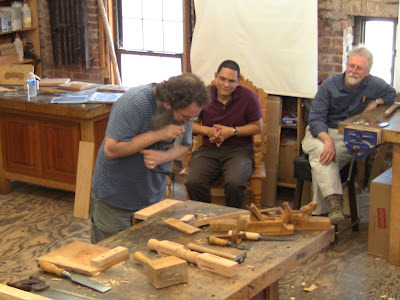 The resulting carving, with another example on the bench. ...and bevel down. Some of these are sweeping cuts to follow the curves. If a chip is not coming out, wiggle the tool, don't flip it up, because that can cause a bigger chip to tear out. Nailing down another panel. Many period pieces show the nail holes, they weren't done in the waste. Closeup of the crisp carving and one of the nails. The dressed panel has seasoned for a week before carving to just dry out the surface. Layout is done with marking gauge, compass, and square. 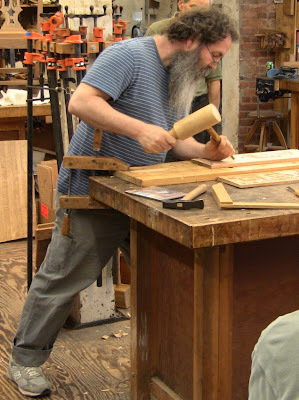 Peter disassembles the panel he built for illustrating frame and panel construction when he first started at Plimoth Plantation. 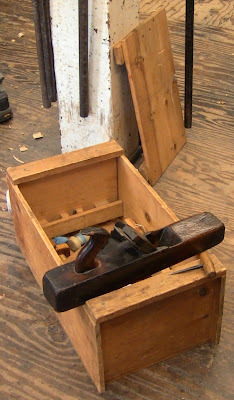 This shows the back side, where the panel has been raised with the hatchet and plane to fit in the grooved frame; that also deals with any variations in thickness, presenting a uniform flat face in front. 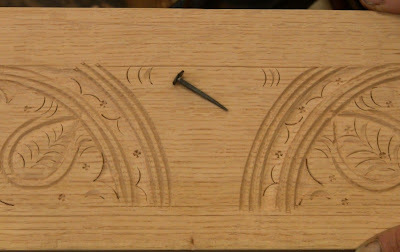 The front side of the panel is carved. 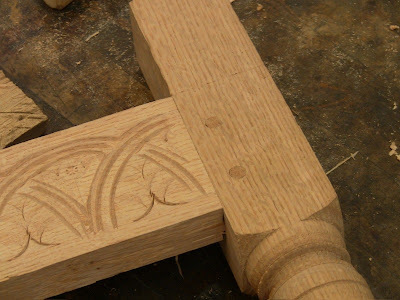 The pegs are omitted from the left-hand mortise and tenon joints for easy disassembly. 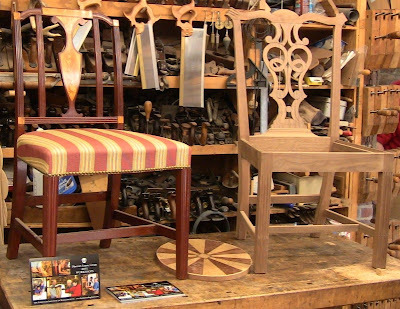 Here are a couple of chairs built by our host, Phil Lowe. These are deserving of a SAPFM meeting and blog post all their own, don't you think, Freddy? Hint, hint? It was quite an inspiring day. I badly wanted to try this, and now I have the opportunity. In central Massachusetts, there's always an oak down somewhere nearby. One had appeared just down the street from my house a few weeks ago. Since my wife had put her foot down about bringing stray logs home, I had resisted the temptation. However, after seeing Peter, I just had to get some material to practice with, so I popped on over this evening after work to say hello. Of course, it had all been cut to convenient firewood length by the power company, but I figured there was still enough for some small carved panels and rails and stiles. I found two marvelously straight-grained sections unsplit. One whack with the sledge on the wedges sent them clear through after they were set in a score line. Even the 1/16th splits came out beautifully. There are just a few minor defects in the wood. Thanks, Jane, I'll make you a nice little box from some of this! 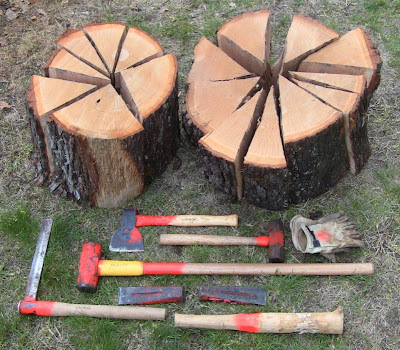 About 15 minutes of work with the tools shown (though I didn't actually need the froe for these splits; it's one I ordered from Drew Langsner 5 years ago). I didn't quite get the puzzle back together properly when I got it all home, but you get the idea. Here are two videos of the day. Consider these the motivational programs; get Peter's DVD for the instructional program. Note to readers: Blogger apparently reverted this post (and possibly the entire blog) today to a previous version that was an unpublished draft, so if you had trouble finding it, that's why. I've restored it from the page I had left open in my browser, though I may have to reapply a few later edits. I've also made a current backup of the blog!